I stayed in London at the TravelLodge at City Airport on Tuesday night for an office Christmas party. I got up before sunrise the next day (though still got a lie-in compared to the normal time I need to get up to catch the train!) 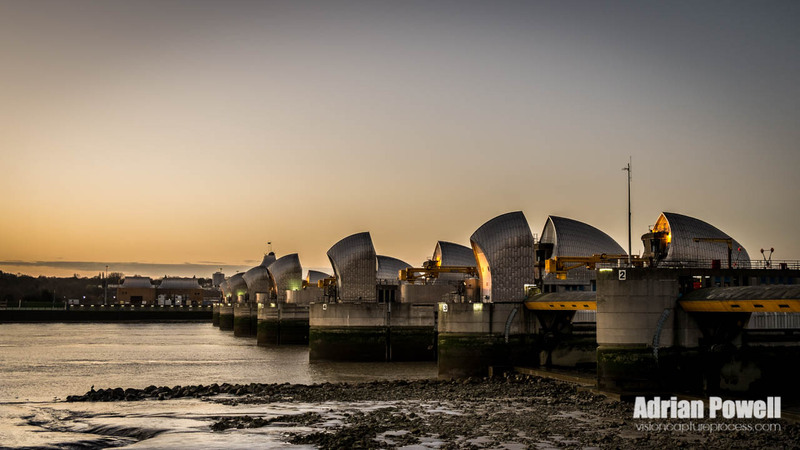 and headed down to the Thames Barrier – this is the first time I have seen it up close – and wow, it is huge. It would have been better to see it at high tide, but low tide is better than not at all! This shot is around 15min before sunrise – I would have needed a tripod to capture this any earlier…in fact, it would have been better with a tripod anyway (could have shot with a smaller aperture and longer exposure). Adjusted levels on this photograph, added a gradient to enhance the sky a little – removed some birds flying in shot, lifted shadows in front of the barrier and sharpened to enhance the details.